I finally felt that I was in a writing frame of mind, despite my dodgy shoulder, and I’ve reached the first Nanowrimo milestone of 5,000 words. The good (but difficult) part of Nanowrimo is that you aren’t supposed to edit, just write – I struggle with that as I can’t even send a text, tweet or email without editing it several times. Also, I feel the need to research everything I write, so end up finding myself on the internet, off on weird tangents (today I was looking at very expensive houses for sale in the region). That too is against the rules of Nanowrimo. I’ve also discovered that I work better with a playlist or musical accompaniment – music can transform your mood. If my characters feel unloved or unattractive, I can just play the music from my teenage years and I’m right back in the moment! I’m currently listening to ‘Damn, I Wish I Was Your Lover’ – make of that what you will, with regard to the character’s frame of mind. I hope my yearn to write continues at the same pace tomorrow and I might just catch up to those writers who started on 1st November. I’m trying to vary my posts a little from purely book-related offerings, so here are my views about ‘The Apprentice’. The views are all my own…since I’m the only person in the house who can tolerate watching it. My main problem with the show is that I always feel that, given an hour or two, I could complete a lot of the tasks that they are given. I cringe when there is in-fighting in the group, which adds to the suspicion that the contestants are chosen for their abrasiveness or their conflicting personalities, rather than being the cream of UK entrepreneurs. The project leaders are set up for failure, as in a normal work environment, you have to be a team player and, while you might not respect or agree with your boss, you have to respect the chain of command or you would be disciplined – there’s none of that on the show. I admire anyone who does things like this to get themselves forward in life, but often wonder if they stop to think what they look like to the public, when they stab their co-workers in the back. Perhaps they’re successful in business because they don’t actually care – I know that I’d be out in week one! Sadly, around a fortnight ago, we lost a family friend – a friend of my mam’s, initially, but she’d been around my whole life and was practically family. Aside from that, she was just a wonderful, kind, generous, funny lady and she always supported my writing. So, on Friday we attended her funeral and it was just like her:understated, unfussy and classy. In stark contrast, on Sunday, I was given the honour of being my friend’s daughter’s godmother – it was a lovely, cheerful service and the baby behaved incredibly well. Aside from the family events, we had tickets to see a show on Wednesday – Navi, King of Pop. My husband was a huge fan of Michael Jackson and we had tickets to the ill-fated shows that never were, at The O2, so he likes to see the tribute acts. As copycats go, Navi was very good and his singing was excellent. It was a bonus to see Michael Jackson’s tour guitarist, Jennifer Batten, but the overall production values were little more than those you’d see at a decent school play. I was dazzled a few times by, what looked like, car headlights on the stage, which would flash intermittently. I think we’d been spoiled by seeing Thriller Live a few years ago. Sadly, just as my favourite song came on, I felt a bit rough and we had to head for the taxi. I don’t think I can blame the food we had earlier in the day. We don’t go out much so like to try somewhere new when we’re in town. This time, we tried Hei Hei on Dean Street..It was just opening when we got there at 5pm, so we had private dining for the most part of our meal. It’s quite a small restaurant and we opted for the set menu (£8.95 for two courses, which were cooked to order). I wasn’t feeling too adventurous so stuck to wan ton and szechuan beef. Hubby was tempted by something porky, accompanied with ‘black fungus’ – it looked delicious. I’m sure we’ll return. 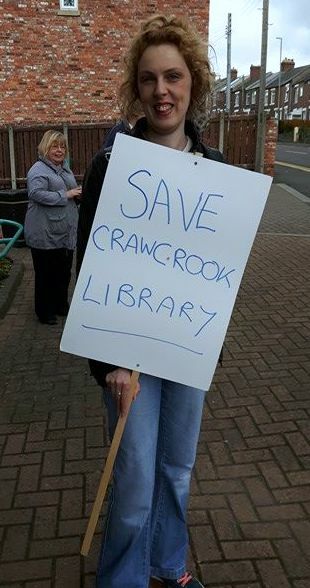 Today was my first ever protest, complete with placards. As I get older, I realise how important it is to stand up for things that you believe in, rather than expecting other people to do it. If everyone waited for someone else to make a difference, nothing would ever get done. 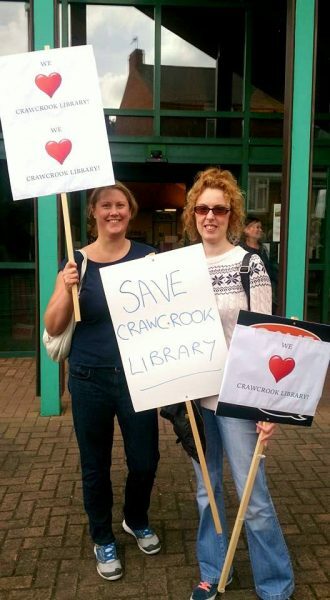 Libraries are all around us…or are they? Many are under threat due to ‘cutbacks’ and are seemingly easy targets because everyone has access to the internet or buys books on Amazon. But do they? There are many people who rely on the library such as the elderly or those seeking jobs. People go there for many reasons and it is often those people who don’t have a voice, when facilities like this are threatened. When I was young and first suffered from M.E., there was no internet. There was no TV in my bedroom. What there was, was a library opposite my doctor’s surgery, and a trailer library that visited my village. When I had books, I could forget about everything bad and transport myself to a world where children went off on adventures and solved mysteries. They had picnics and drank ‘lashings of ginger beer’. There was magic and mayhem and it all happened within the pages of a book. I borrowed a lot of books. It didn’t cost a thing. Not only did it pass the time, but I learned things and I didn’t feel lonely when I was absorbed in a book. Surely, future generations deserve the same access to books that we had. Had I not read such a wealth of material, I doubt that I would have written a single book, let alone a third novel, so I feel very sad that the council could even contemplate closing this valuable service, in the name of cutbacks. Books are the building blocks of knowledge and what kind of society limits access to only those who can afford to pay? So, this is why I protested. We stood as long as we each could manage: the very elderly lady, the parents, their children, the readers, the writer, the community. 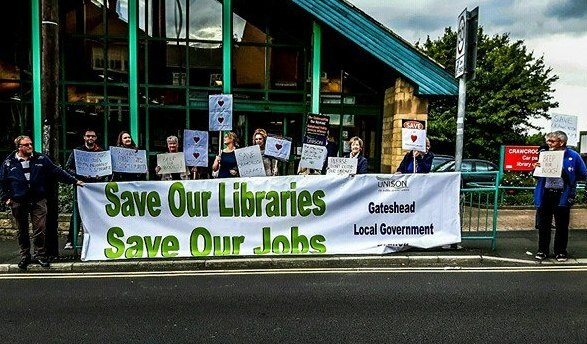 Hopefully, we spoke for those without voices and we have made it clear that we value our library and it should remain as a source of knowledge for years to come. I’ve always found art very relaxing and have recently started doing some painting. It’s not something I’ve done a lot of (despite doing A-level Art) but I’ve done a few animal portraits lately, just to see if I could still wield a brush. It’s a great procrastination tool, when I’m not in a writing frame of mind. At the weekend, I entered a local scene at the Village Show and managed to get third place. My prize was £2…and I was delighted because it’s more than I make from selling a book! The nice thing about it is that the paintings and photos, if not collected, are auctioned off and the proceeds go to charity. I’d love to think that it made at least double figures! I would add a photo but I’m not sure how to do it, as WordPress has changed a fair bit since I used it regularly. Hello again! I didn’t realise just how long it had been since I posted on my blog, and I’ve decided that I’m going to talk about more than just writing and books. So much goes on in the area in which my books are set that it would be silly not to include it – I’ve been trying out new places to visit and to eat, so I’m happy to share my experiences, good and bad. I’ve started writing the third book, though finding it far too easy to get distracted (from fostering dogs to rediscovering art – if I get a lot of practice, it would be great to do commissions). That will do for a brief update, and I’m going to try and write a new post at least once per week (Fridays?) unless I have anything interesting to tell you. Hopefully, I’ve remembered how to use WordPress properly and this appears on my website! If you got the Metro newspaper yesterday, you might have noticed that I got a mention. Crushed was listed as one of the wonderful actress/novelist Pauline Mclynn’s three ‘desert island books’. I was surprised and delighted. I wish that I could remember how to post a photograph here so that I could show you. Hopefully that will generate another sale or two! I should remind you that if you purchase books through Feedaread, they will take a week or so to arrive, as they are freshly printed just for you – I love new book smell! There is an accompanying playlist on Spotify, which is free to join. I know how frustrating it is when songs are central to a book’s story and you’ve never heard them! I hope that you enjoy it and please feel free to contact me if you spot an error. Draft two of the book is finally complete and I have some kind people reading through it, pointing out my mistakes (and with my ME/CFS brainfog, they’ll have their work cut out). I grew to love the characters so I hope that everyone else will, too. I’m still on track to publish the book on 24th October, my 40th birthday. Lots of work to do on the book cover and my website is still woefully out of date. If I can’t do things myself, I need to rely on experts. In other news, as you know, I prefer not to do anything daring but have signed up to do a 230m zipwire across the Tyne in aid of two charities: Marie Curie and Cavalier Matters. I am already having nightmares so would appreciate ANY support -I’m already imagining passing out half way across or not being securely fastened in. Scared but for good causes, that mean something to me or my extended family. Even if you can only donate a pound, it will help. Many thanks! I’m not expecting to raise a lot, as I don’t know a lot of people to ask for sponsorship, but figure that every little bit will help the charities.